Elixir Software Group has come up with a cool idea -- the gCard. 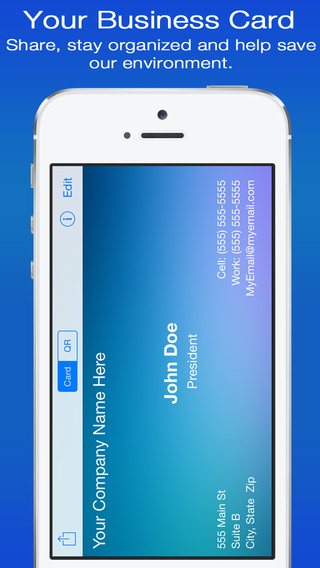 This is a new business tool for iPhone, iPad, and iPod touch devices. Available in a wide range of colorful backgrounds, gCard is a virtual business card that allows users to electronically share their information. gCard transfers contact information using a vCard so it is compatible with most devices and computers. 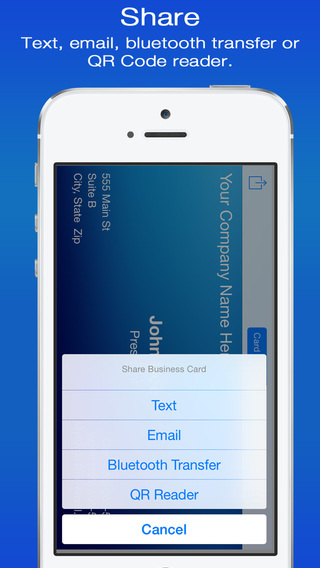 With a simple tap, users can share information by text, E-mail, Bluetooth transfer, or QR code reader. gCard also features a built-in QR generator that can automatically generate a QR code for the user. gCard is a new and revolutionary app that helps you stay organized, save time and money, and be environmentally friendly ... The idea of gCard evolved one day when I was sitting at my desk. I glanced over at my desk shelf and noticed the large stack of business cards that I hadn't had the time to input into my Contacts list. I thought to myself that there must be an easier way to quickly share business cards in a professional manner that was still visually appealing to the recipient. Thus, the idea of gCard was born. With gCard, there is no need to carry a business card again. Since most people have their phones with them at all times, their business cards will also always be with them. gCard is environmentally-friendly, it saves money on printing business cards, and it will save you time. gCard has been designed to revolutionize the business card and make our professional lives so much easier! gCard 1.0 is free and available worldwide exclusively through the App Store in the Business category. Agoura Hills, California - Based in Agoura Hills, California, Elixir Software Group, Inc. is an independent software developer that was founded in 2011 by Steven Abrams. Copyright (C) 2014 Elixir Software Group, Inc. All Rights Reserved. Apple, the Apple logo, iPhone and iPod are registered trademarks of Apple Inc. in the U.S. and/or other countries.